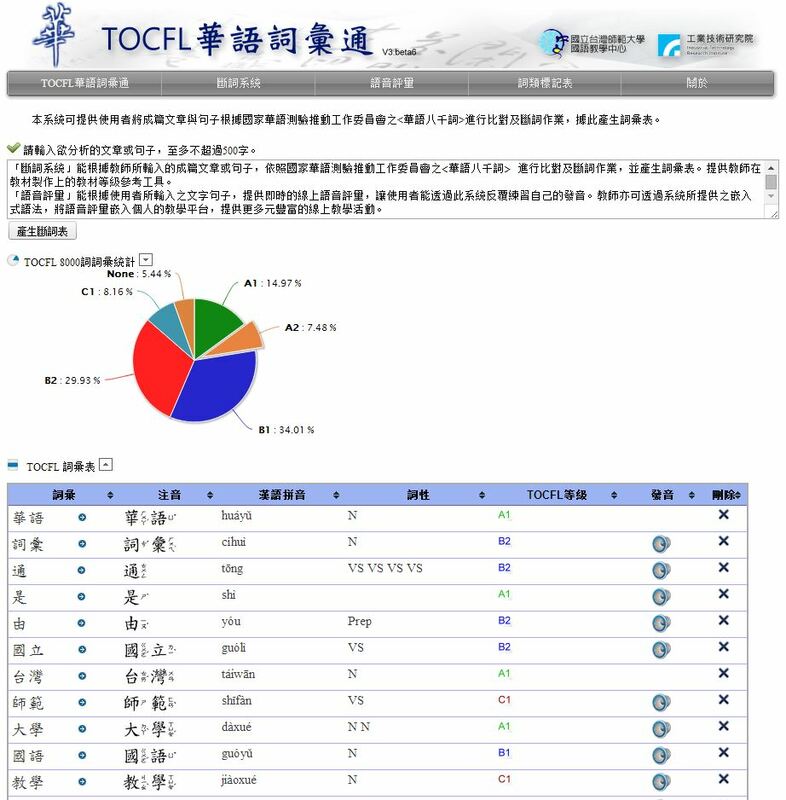 Developed jointly by Mandarin Training Center of National Taiwan Normal University and Industrial Technology Research Institute, “TOCFL Huayu Analyzer ” is an online reading aid for Chinese learning. ” TOCFL Huayu Analyzer ” includes two subsystems, Word Segmentation system and Voice Assessment. Word Segmentation system can break texts entered by teachers into words, phrases, and symbols; also evaluating the difficulty level of each word according to “Chinese 8000 words” drawn up by the Steering Committee for Test Of Proficiency-Huayu to generate glossaries. The glossaries serve as references for teachers to write on appropriate teaching materials for learners of different Chinese proficiency levels. Voice Assessment analyze sentences recited by users and evaluate their pronunciation in real-time. This system allows users to practice on their pronunciation repeatedly. Teachers can retrieve syntax from this system and embed the syntax into their own teaching platform, providing a greater number of diverse online teaching activities.